Derek Pye doesn’t talk about his national and world records much at school. As a paraeducator helping special education students at Millikan High School, and as a track coach at Bancroft Middle School, he prefers to keep the focus on the academic and athletic accomplishments of his students. Pye began as a special education teacher at Bancroft, where he has coached boys and girls track for 20 years. He shifted from classroom teacher to paraeducator because it allowed more time to balance his coaching, training and weekend competitive track meets, including the ones that his son Ereq Pye, a sophomore in the Poly PACE program, now competes in. After attending Wilson, Derek Pye went on to Long Beach City College and Cal State Long Beach. Today, he enjoys seeing his former students earn full-ride scholarships and more – students like Pedro Ramos, who accepted a scholarship to UC Riverside, where he obtained his degree and is now heading to law school. “We get a chance to see a lot of former athletes do well and get to go to college, which is really big for their families as well,” Pye said. Upcoming competitions for Pye include events in Australia, Spain and South Korea, but first there are the prestigious Penn Relays from April 28 to 30 at the University of Pennsylvania. If he wins big, his students probably won’t hear it from him, whether on the track or in the classroom. WORLD CHAMP – Wilson High School graduate and LBUSD employee Derek Pye set a new world record for his age group last month in the 60 meter hurdles. 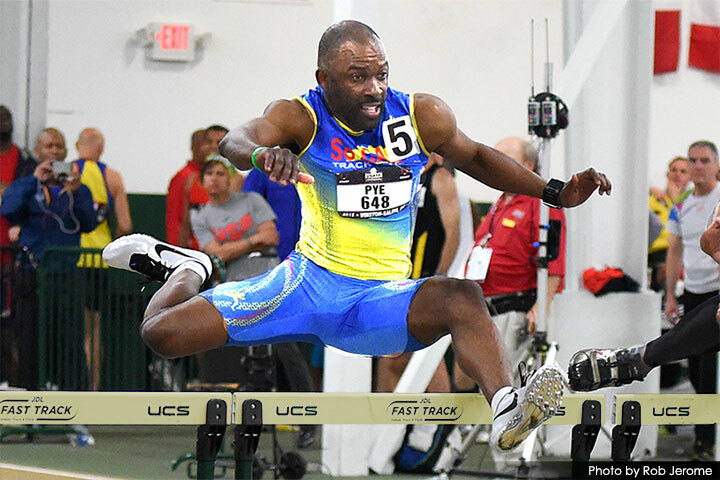 Here he competes in the 2015 Indoor Nationals in Winston Salem, N.C. Pye coaches track and assists special education students and teachers as a paraeducator. Photo by Rob Jerome.